The big Baroque cathedral of little Piazza Armerina in central Sicily. After four days on my own in Catania, I joined 14 upbeat Brits ― plus our superb shepherd Sue ― for an eight-day, nonstop romp around the island. And here are my highlights. Morning view of Mount Etna from my hotel room in Catania. Looming over eastern Sicily, it's the tallest active volcano in Europe ― nearly 11,000 ft (3,300+ m) high. The separate smoke plumes reflect that Mt Etna has "a series of nested stratovolcanoes with four distinct summit craters." Mt. Etna could again erupt violently at any time, most recently just three months ago, but that does not deter visitors. With Trever and Robert while Etna smokes. We're about 9,500 ft (2,900 meters) high at this point. A distant vista of Sicily far below a new crater on towering Mount Etna. Of the many beautiful churches, most dazzling interiors were two in the Palermo area and both featured breathtaking Byzantine mosaics: The Palatine chapel of the Norman kings (first above) and the cathedral of Monreale (second above). 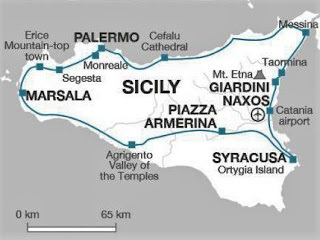 Greeks intensively colonized Sicily (circa 800 BC - 200 AD), building cities complete with enormous temples and large open-air theaters. 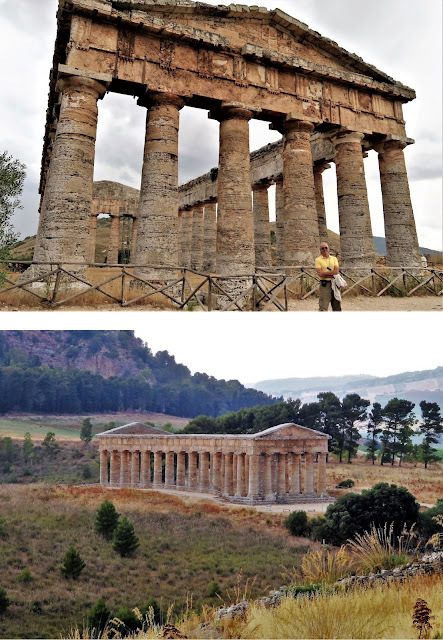 Among the impressive sites we visited, the setting of this Greek temple in Segesta made it especially memorable. Last three: Busy and chic Taormina where the G7 met two weeks earlier. In all the old towns, cozy little lanes open on a piazza with a church and cafes. The one in Syracusa's Ortygia was the most extraordinary. 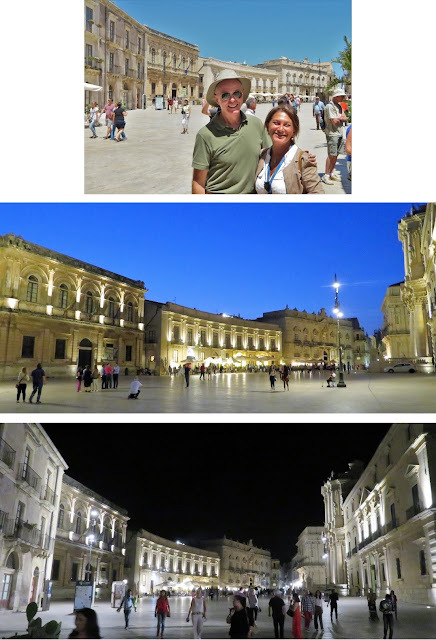 With guide Carmina in the top photo. Cefalu, an old, scenic, fishing village with a Norman cathedral, small beach, and lots of tourists. Deep blue Mediterranean meets the black volcanic rocks supporting Cefalu. Walled mountaintop Erice, densely packed like all the other medieval towns. Skyline of Palermo viewed from the top of the cathedral. With Lesley and Lois in front of Palermo's Teatro Politeama Garibaldi. 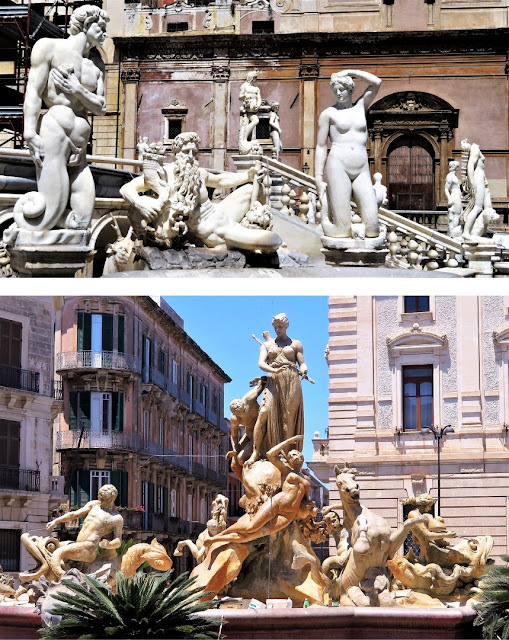 Italians don't much bother with big simple fountains, preferring instead fantastic concoctions of mostly naked voluptuous women and muscled men, sometimes accompanied by stampeding horses and strange sea creatures. Many books are devoted to the incredible fountains of Rome, but Sicilian fountains deserve books too. For a few days, I binged on addictive gelato but eventually cut back to merely ordinary excess. After extensive taste testing all over the island, the champion gelato shop was definitely Scialò in Marsala. Scialò's pistachio-orange-lime was alone worth this trip to Sicily. My camera could only capture part of this wall of wine in Catania. Culling my hundreds of pics of striking churches, Greek ruins, restored old towns, scenic views, and Mt. Etna yielded these favorite highlight photos of my highlights tour around Sicily. Every day was outstanding.